I wasn’t consciously aware my mother had an eating disorder until she was in her 90s— bone thin and dying of leukemia. She had just finished a small piece of chocolate cake and commented on how yummy it was. I asked, “Do you want another piece?” She replied, “Oh no. That’s too many calories.” I instantly knew why I was bulimic in my 20s, why my sister was a compulsive overeater most of her life and why my daughter was anorexic during her teens. What I realized at that moment with my mother was that we pass on our unhealthy attitudes toward eating and food to our children. The estimated 8-10 million Americans with eating disorders don’t grow out of them simply by getting older. Kids who are affected bring their unresolved eating and body image issues into adulthood. And their children adopt these attitudes through observation. Children notice if parents skip meals, count calories, are constantly on diets or the scale, and are preoccupied with their body and weight. The message? Appearance matters more than health. The result? 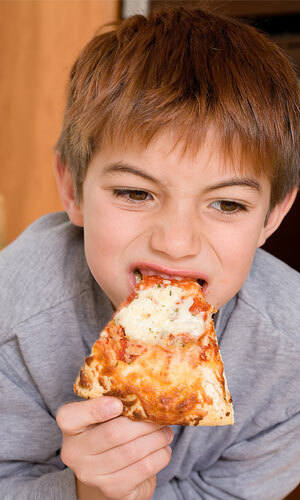 Children may develop guilt and fear over their own eating habits. Psychiatrist Kathryn Zerbe says it’s common for someone with an eating disorder to impose it on others, directly or indirectly. The targeted family member may feel ashamed or guilty when eating in front of the person afflicted with the disorder. One night, my sister and I were having dinner with my daughter and granddaughters. My 4-year-old granddaughter stuffed a piece of bread into her mouth to the delight of her younger sister. However, my sister’s look of repulsion immediately squelched the fun. The lesson in shame was inadvertent, but her later comment about my granddaughter’s expanding belly caused a rift in the aunt-niece relationship. I realized if I want to share in my daughter’s life, I cannot give unsolicited advice about her kids’ eating practices. Don’t criticize your child for his weight. It’s shaming and may cause him to eat to soothe his negative emotions. Lead by example. When feeling sad, mad or bored, do something other than eating to teach your child healthy ways to handle emotions. Examine your youngster’s dreams. Does he overemphasize body shape? Encourage your kids to exercise. It’s important to maintain a strong body. Plus it feels good to move! Try not to avoid activities because they call attention to your body. Refrain from fad diets. Discuss with your child the importance of eating well-balanced meals. Avoid complaining about your weight in front of your children. Ban teasing about weight inside the home. Don’t laugh at jokes about over- or underweight people. Use empowering words when describing meals. Label them as healthy or unhealthy, not good or bad. Let food be just that, food. It’s not a punishment nor a reward. The best thing you can do for your children is offer them unconditional love, encouragement and support. They need to know you are proud of them and care for them because of who they are, not what they look like. Remember, self-esteem is perhaps the best antidote to disordered eating. Patricia Kochel is a retired teacher who also facilitated teen support groups.